In early April I wrote in a post that I had cut all of the fabric ahead of time since there was a strip of each fabric in every block. I guess 6 months for making a lap quilt is not that long, but usually when I get right into it, it takes less time. I had finished the top by the end of April so it looks like I was busy with other things in May. 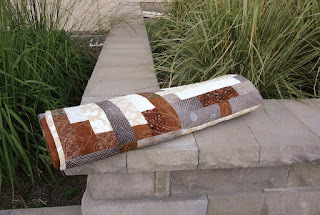 On the last weekend in June I had sandwiched the quilt and started FMQ it with stencils. Just in time for my June OMG (One Monthly Goal). Then I got bored and a little frustrated. Turns out that marking the stencils was very difficult on these different shades of brown. 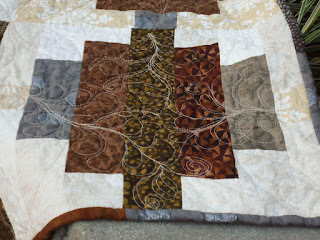 I was hoping to finish quilting it by the end of July - it was my July OMG, but that didn't happen. 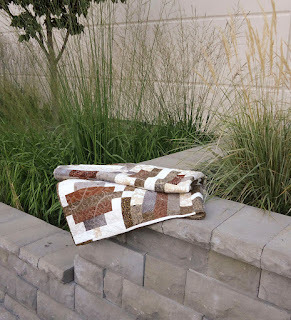 I finished quilting it by the end of August but have had so many things to blog about that I'm just getting around to it. We also had a major heat wave for the last two weeks and I was estivating. No way I was going outside for the photo shoot in that weather! I've actually found another spot to take pictures near my home, but it seems to be more convenient for me to just take the quilt to work in the morning and take the pictures before I go in to work. I'm keeping this post simple - just pictures from the photo shoot. I had so much fun snapping those pics! Isn't this baby photogenic? In the end I did a lot more FMQ without stencils because the marking was just getting ridiculous. It also took quite a while quilting between all of the blocks. 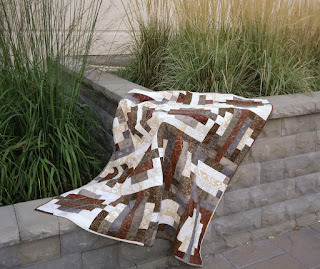 I do like the results...and this quilt will go to my sister-in-law before her 61st birthday! 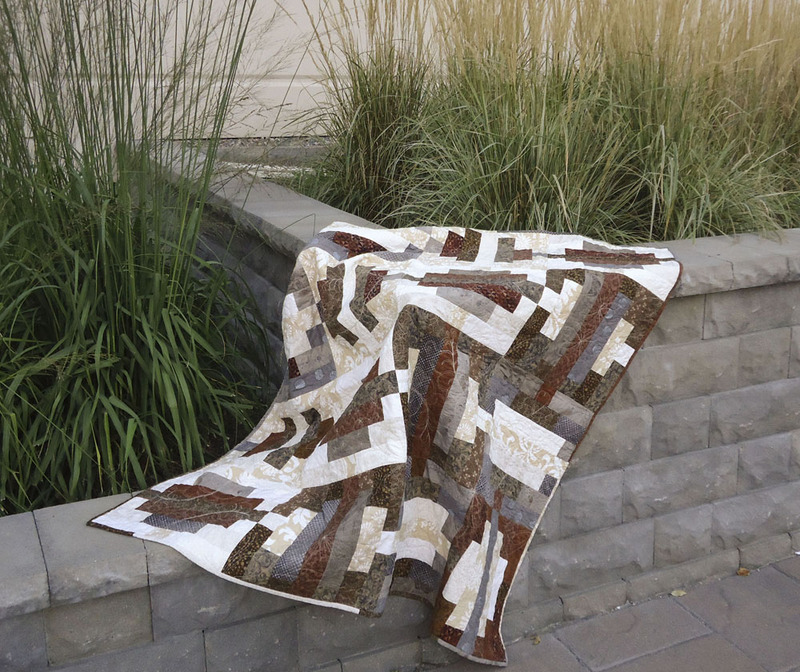 This quilt was also one of my goals for the 3rd Quarter Finish-A-Long. Here are the links to my original goals, the 3Q FAL goal setting link up and the final link up. It's such a great thing to be able to look back on my blog and see what I did many months ago. I don't usually remember what I did yesterday or this morning, so having a diary of my quilting adventure is a real treat! I could never have written this post with any accuracy without past posts! 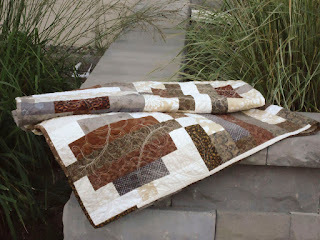 I like using stencils to follow when FMQ because it gives me other patterns that I would not be able to do free hand. 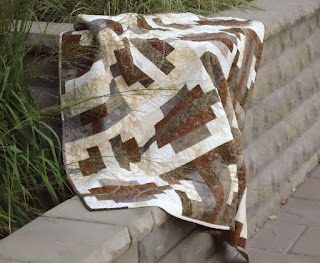 However, marking a stencil on a quilt with fabric from light to dark made it very difficult. The very dark and very light fabrics were fine. It was those in between that gave me trouble. I tried not to over FMQ this quilt since I didn't want it to be too stiff. I think that it turned out well. 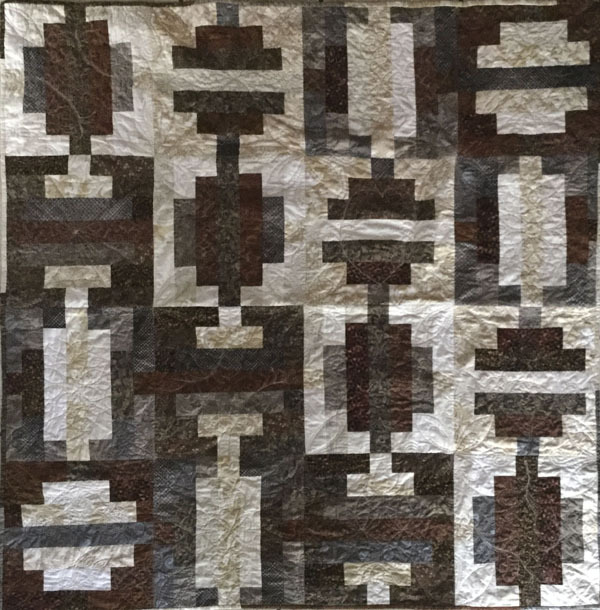 Based on the Take 5 Loves Coffee Milk pattern in the More Take 5 Quilts by Kathy Brown. As I mentioned, this quilt is part of my goals for the 3rd Quarter Finish-A-Long. I also linked up my second placemat (Classy and Scrappy 2) and my Hexie Table Topper. The other two projects didn't get worked on at all. Oh well, sew many projects and so little time! 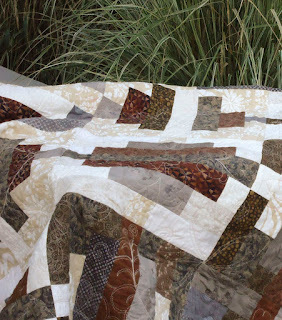 A beautiful quilt and thoughtful gift! I really do love the quilting you did on it. I find photographing quilts to be the part of the process that's the most challenging much of the time. I like your setting! On behalf of the global hosts of the FAL, thanks for linking up! Thanks Felicity. When I can photograph the quilts outside, they are always so much better. Thanks to all of the hosts of the FAL! It's beautiful! Your sister will love it. Very pretty quilt, lucky sister to receive it. What a great quilt. I'm sure your SIL will love it! That's a pretty cool place to take photos, too. Your quilt is lovely! My husband would love those colors! I, too, enjoy reading my blog as it reminds me of those projects I finished/started (where are they? ), and my growth over time! Thank you for sharing such a great post!